Christmas holds special meaning for many around the world. For many Americans, especially those who hold their Creator as the source of Liberty, Christmas is pregnant with meaning--The Christ-child who's birth brought freedom from spiritual bonds also affirmed and nurtured humanity's understanding of Liberty, dignity, in the physical world. The thirst for freedom from oppression and tyranny led America's first patriots across the Delaware on the night of December 25, 1776 to Trenton... a decisive turning point in the struggle for independence. A nation was soon born. 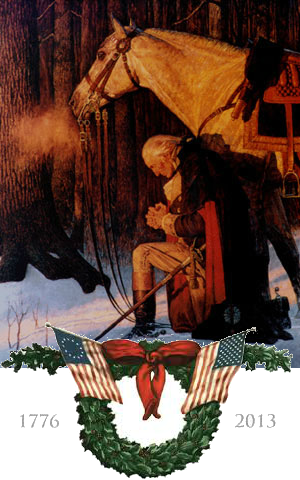 Perhaps, Washington prayed that night for his men and their battle on behalf of Liberty with the manger's promise in mind. On this Christmas, let us hold in awe the meaning of that manger while we keep in our hearts those men and women who willingly put themselves in harm's way to secure for us the full measure of life, freedom to pursue our God-given potential.